See how to connect your data and build in Klipfolio, step-by-step. The human resources (HR) market continues to grow for tools focused on teams, feedback, and continuous performance management (just to name a few). And this $14-plus billion marketplace for HR software and platforms is only getting started. CB Insights estimates that the more than $3 billion of venture capital invested in the sector last year is just one reason why the sector will continue to expand. As an HR professional, you don’t need to be told about the role HR plays in your organization. You know how important it is to have a solid strategy for recruiting and retaining top talent. Now boards are starting to recognize the importance of this as well. Board members are seeking more input from HR during quarterly meetings, which is helping raise the profession’s profile. The expectations for reliable data on key HR metrics, though, is growing as well. HR professionals will be looking to add more value during these meetings with data-driven recommendations. As anyone who has attended a board meeting knows, questions can come from unexpected angles. Preparing the data in advance can help grow trust with board members and build your department’s reputation in the organization. But how do you ensure you’re providing accurate and up-to-date data on the most important HR metrics? Building a dashboard isn’t enough (though, obviously, it helps!) – you also need to ensure you have selected the right key performance indicators (KPIs). Here are a few KPIs to get you started with your HR dashboard. You can pull these up at any time on your dashboard, ensuring you’ll always have the right answers when a board member comes calling with questions. You can also break down many of these metrics further based on other dimensions, such as level, location, team etc., so they’ll align perfectly with how your organization is structured. This board gives you a general overview of how your company is performing in general HR activities. You can’t run your company if you don’t have an accurate portrait of your current employee structure. This will help quickly give you answers on basic questions about where your recruitment efforts stand, how frequently your employees are leaving and how much value you’re getting for each employee. Bringing in top talent is (or should be) a key priority for any organization. These metrics will give you a quick check-up on the state of your recruiting efforts. Recruiting top employees is only part of the equation. You also need to ensure they’re engaged, satisfied and happy in their jobs. 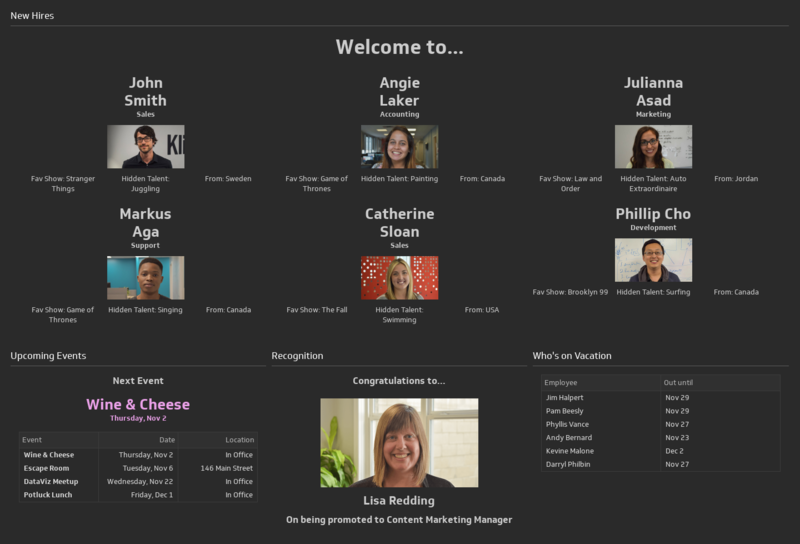 This board gives you an idea of how employees are responding to your company culture and identifies any major shifts in satisfaction levels. Employee comments/accolades: A snapshot of what your employees are saying about you. Employee net promoter score: The employee Net Promoter Score answers the question of how likely your current employees are to recommend your company as a place to work to others. Dashboards can do more than just check in on key metrics. They also have an important role to play in employee engagement and communication. Creating a wallboard and placing it on a TV in a common area, such as a lunch room or common area, can go a long way to achieving these goals. Looking to drill deeper into your current employee base? 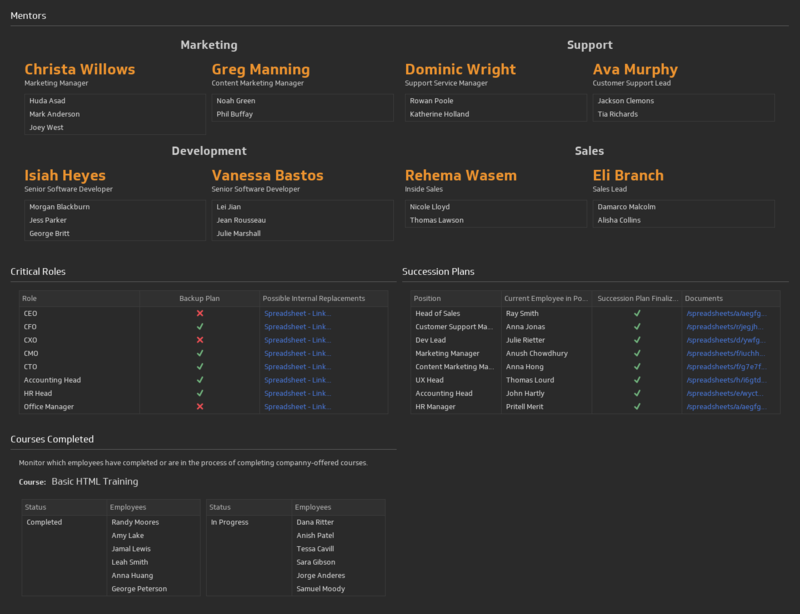 This board will give you the ability to identify areas where you’ll need to add more employees and plan for the future. These metrics will help you identify potential gaps in manpower you’ll need to fill. Diversity rate (male to female): Does your workforce skew more male or female? The hiring process is an essential part of recruiting and retaining top talent. These metrics will help you focus in specifically on how potential employees are engaged with the company. HR is about more than just recruitment. You also need to consider how you are allocating your current workforce across the company. Number of days outstanding/utilized: A high number of vacation days that are yet to be utilized shows you will need to plan for some absences around the office. Depending on your contractual arrangements with employees, it also could signify a financial liability should you need to pay departing employees for unused vacation. Are your employees missing a high number of work days? There’s only one way to find out. These metrics will give you a sense for whether your workforce is taking a lot of sick days – or maybe coming into work even when they’re sick – as well as other reasons for missing work. Overtime can get costly in a hurry. Figure out which parts of the company are utilizing lots of overtime so you budget accordingly and even look at hiring new employees where necessary. Employees are one of the largest (if not the largest) expenses a company needs to cover. Track how much you’re spending on your workforce with these key metrics. Employees don’t just earn their salary – in many cases they also receive benefits that come out of the company’s budget. These metrics allow you to keep track of your spending on employee benefits. Cost of employee benefits: Salary, health insurance, pension, employee savings plans etc. This is particularly important for start-ups, which frequently offer stock option plans for employees. Some matters – such as legal and disciplinary matters – can explode into big problems if you don’t keep an eye on them. Legal matters require close attention. Keep track of all pending and current legal issues your company is facing. Matters of employee discipline can be unpleasant, but if you don’t deal with them in a timely and direct manner you risk making them worse. This will help you keep track of disciplinary issues at each stage of their existence. Nurturing nascent leadership candidates and keeping employees at the top of their fields are essential for ensuring the success of your company into the future. Keep track of their progress with these metrics. This will help you stay on top of HR’s role in evaluating employees’ performance. How equipped is your company to survive a termination, retirement or voluntary departure? Stay in the loop with these key metrics. Employees with leadership potential need to be identified and then coached. Training your employees is essential. Without an investment in employee development, you’ll quickly find your company falling behind its competitors. Similar to many of your team members in the finance department, you are most likely pulling some of this data from a variety of sources. At Klipfolio we see data coming from all kinds of sources – some data in an HR tool, some data in spreadsheets, and some in a corporate data warehouse. That’s where Klipfolio can help. We can pull all your data into one place to help present it to your board, your exec team and your HR team to help really drive home how your department is performing. Your organization is unique, so the KPIs your organization wants to track will be as well. Focus on the key stories you want to share with your direct HR team, the leadership team and the entire organization. Each of these different segments will want to see insights from you that will help them more easily understand the key value the HR team brings to the organization.